While EURUSD is under the influence of ECM monetary policy meeting, EUR was supported by Industrial Production in Germany. The support rests at 1.05090 with resistance at 1.05530 which both lines are below the weekly pivot point at 1.05810. The EMA of 10 is moving with bearish bias along the descendant channel and it is below the EMA of 100 and 200. The RSI is falling towards the oversold area, the Stochastic is showing downward momentum and the MACD indicator is in positive territory. The ADX is showing strong buy signals. 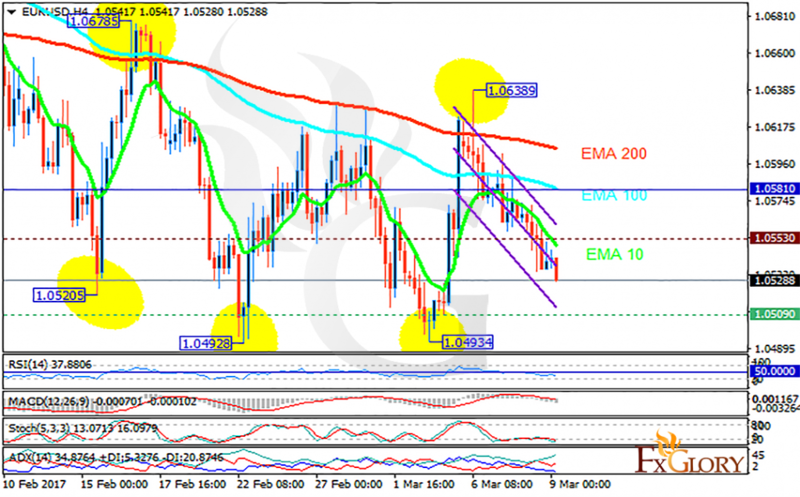 The pair will continue its downward trend targeting 1.0500.